This wheel is worth the money. Great quality workmanship. Nice wheels easy to mount tires on light weight and easy to install! Not sure how these compare to others but they do have a very nice look to them. I would've liked the center cap to be lower profile. It looks like it could be potentially damaged. It sticks out there pretty far. Seem like good wheels. Personally very pleased with them other than the finish which is not a big deal to me because they will be scratched after the first ride anyway. A good looking wheel and a good price. Good color and appears well made and strong. Will need spline lug nuts and an adapter wrench. Really nice wheel, great finish looks like quality. Cascade wheel styling / build looks good. I have not mounted the wheels yet, but the quality looks good. The black color is like a semi gloss, not dull but not super shiny. Nice affordable wheels, fast delivery. Nice wheels, fast delivery. I do wish these wheels had a little deeper dish because the center caps stick out past the rim, which leave them vulnerable as they will break easily. Otherwise, good looking wheel. Seem to be good quality. Cant beat the price. 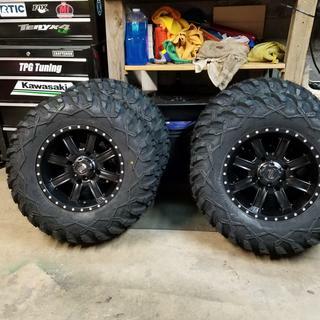 Paired them with 28x10x14 tusk terrabites and couldnt be happier. Ride in western pa where trails are not forgiving. Deep ruts, rocks, roots, mud, got it all and they are holding up very good. I bought these wheels and relied on a review stating the stock Polaris lugnuts will work. This is in fact NOT TRUE for my 2018 RZR Turbo Dynamix. There is no way to get a socket on the stock lugnuts and fit within the lugnut holes even with a very thin socket. Do yourself a favor and buy a set of splined lugnuts and the splined key and save yourself the grief. Luckily for us, the local tire shop had the right splined lugnuts and key. Other than that, the wheels and tires look great on our rig. 14x7 4/3 offset fit the 2013 xp900 perfect.the stock polaris lug nuts fit perfect. I like the off set placing the tire/wheel under the SXS. My last wheel set the Tire/wheels to the out board side of the SXS. This kicked more mud onto my SXS. 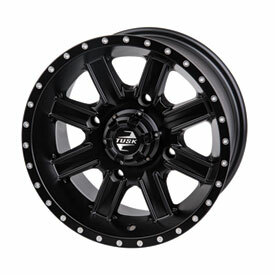 Will this wheel make my 2014 Grizzly wider than stock? I know the ITP wheels SAY 5+2 offset but measure 4+3. Are these a true 5+2? Or are they wider like the ITP wheels? BEST ANSWER: We measure from bead to the center weld of the wheel. Our in house wheels measure like they are supposed to. Which wheel has more negative offset? So what offset would give it a wider stance 4+3 or 5+2? BEST ANSWER: 4+3 will sit out one inch further than the 5+2 giving you the "wider stance", my friend. Thanks. I had same question. How much does wheel weigh? BEST ANSWER: I don’t have an exact number for the weight of the Rim, but it is very comparable to the same size Method Standarf Rim. I have been very happy with these rims on numerous machines. 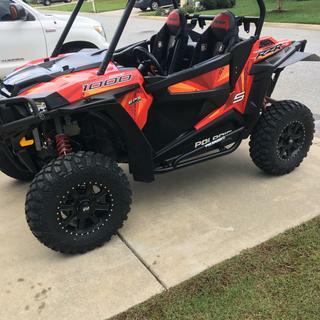 What is the stock offset for the 2017 Polaris RZR XP 4 1000 14" wheel? BEST ANSWER: The stock offset for the front is 4+2 and the stock offset for the rear is 6+2. When mounting these wheels what should the lug nuts be torqued to ? BEST ANSWER: Lug Nuts Should be torqued to Manufactured Spec's Per Machine, Make, & Model, refer to the service manual. especially, If you are adding After Market Items Like Wheel Spacer's, for Off-set wheels. I have 26x9r12 tires what wheel do yo recommend for spare? BEST ANSWER: I just recently bought Tusk Cascade 14in rims 3 plus 4 offset with Tusk Trilobites 27inch tires. So far great performance and looks for money. High recommend !them! 12x7 4+3 offset should work on all corners. 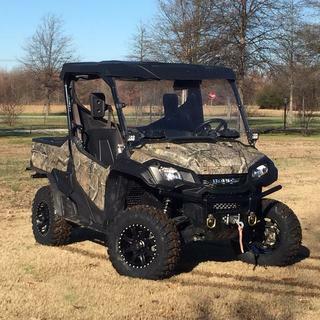 At least on a Polaris UTV. If you order the wheels do they come with a valve stem installed? BEST ANSWER: Yes mine came with valve stems. Don’t forget you need Tappered Lugs for these wheels. It was probably not the norm, but 2 of mine did not. 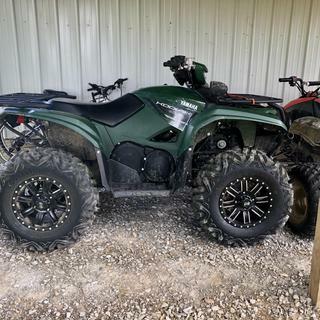 What wheel sizes do I need for my 2018 Kodiak 450 front and rear? BEST ANSWER: If you are using your stock tire sizes then the wheel size will be 12x7. 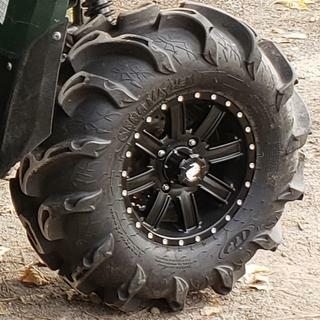 What lugs do I need for theses wheels on a sportsman’s 570 2018? BEST ANSWER: Once you enter in your machine and select color, location and size scroll down and it will have a list of the lugs nuts that will fit with your machine and this wheel. You can pick any from this list. Will 10” wide tires work on these wheels? 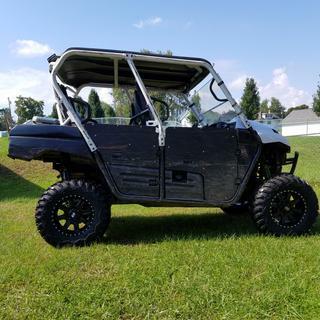 My Sportsman has 25x10x12 tires on 12x8 rears. Seems the 7” rim width might be a little small. BEST ANSWER: Yes, the 10" wide tire will work with these wheels. 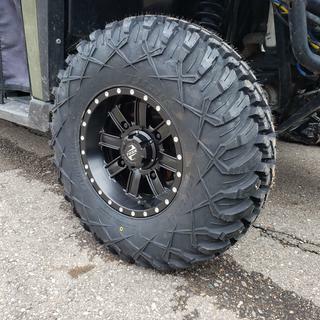 Will the stock lug nuts on a 2013 rzr xp900 fit these wheels ? BEST ANSWER: No this wheel will require a tapered lug nut. THE STOCK LUG NUT IS TAPERED 3/8 & USES A 17MM SOCKET. The product details says it( has over size lug holes fit common 17mm sockets). Does this wheel only come in the 4 +3 and the 5+2 off set? I am looking for a 4+2 off set. BEST ANSWER: I would be happy to check for you. What is the make, model, and year of the machine you will be putting these on? I will be putting them on a 2015 polaris rzr 570. I want to keep the 50" width. Thank you! Thank you. I've checked into this and unfortunately we do not have the 4=2 offset on these wheels. If you are keeping your stock wheel size it looks like we do carry the Polaris OE 8 wheels in the 4+2 offset. BEST ANSWER: This wheel in a 14" size is approximately 18 lbs. 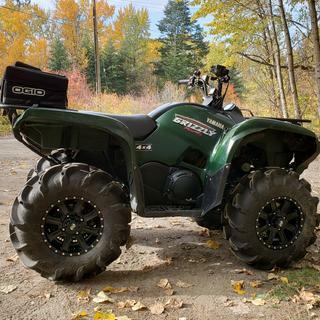 Im looking for a front wheel for my 2016 honda pioneer 10005. the tire size is 27x9x14. Will this wheel fit? BEST ANSWER: Yes, you will need to enter in your machine the drop down boxes above the product image. Then the last number of your tire size indicates your wheel size. Your wheel size would be a 14x7. This wheels says 5+2 Offset for my grizzly. Is it a true 5+2 Measurement? Or is it more like a 4+3 like the ITP wheels. BEST ANSWER: These will be a true 5+2 offset.